18V-646: Certain 2018-2019 Freightliner Business Class M2 vehicles manufactured from December 1, 2017, to August 3, 2018. The steering shaft assembly may have been installed incorrectly, which can cause loss of connection between the steering wheel and the front wheels. Recall start: November 2018. Daimler Trucks recall number: FL-791. Daimler Trucks, (800) 547-0712. 18V-677: Certain 2017-2019 Freightliner MC motorhome chassis manufactured from August 30, 2016, to April 9, 2018. In the air brake system, the primary air line was incorrectly connected to the secondary air pressure gauge, and the secondary air line was connected to the primary air gauge. As a result, incorrect air pressure readings may occur. Recall start: November 2018. Daimler Trucks recall number: FL-793. Daimler Trucks, (800) 547-0712. 18V-699: Certain 2019 Freightliner Cascadia vehicles manufactured from July 9, 2018, to August 2, 2018. The steering wheel may loosen over time and may detach from the steering column. Recall start: December 2018. Daimler Trucks recall number: FL-796. Daimler Trucks, (800) 547- 0712. 18V-703: Certain 2018-2019 Freightliner Cascadia and Business Class M2; and Freightliner Custom Chassis Corporation XCL, XCM, XBS, XCP, and XCR chassis. The brake caliper mounting bolts may have been insufficiently tightened, which can reduce brake effectiveness. Recall start: December 2018. Daimler Trucks recall number: FL-794. Daimler Trucks, (800) 547-0712. 18V-742: Certain 2017-2018 Freightliner Cascadia vehicles manufactured from June 8, 2016, to June 30, 2017. The brake lights may remain activated after the brake pedal is released. Recall start: December 2018. Daimler Trucks recall number: FL-799. Daimler Trucks, (800) 547-0712. 18V-743: Certain 2018 Freightliner Sprinter 2500 and 3500 and Mercedes-Benz Sprinter 2500 and 3500 vehicles manufactured from July 4, 2018, to July 19, 2018. The right-side door latches may have been built with incorrect components. As a result, when the doors are electronically unlocked, the right-side doors may not be able to be opened from inside or outside the vehicle. Recall start: December 2018. Daimler Vans, (877) 762-8267. 18V-687: Certain 2019 Aspire, Anthem, and Insignia motorhomes manufactured from January 16, 2018, to August 29, 2018, and built on Spartan Motors chassis. The park brake may not prevent the vehicle from moving unintentionally if parked on a grade. Recall start: October 2018. Entegra, (800) 517-9137 or Spartan, (855) 589-9836. 18V-688: Certain 2019 Anthem, Aspire, Cornerstone, and Insignia motorhomes manufactured from January 10, 2018, to March 1, 2018. The entry doors have latch rods that may be improperly adjusted, allowing the door to open during transit. Recall start: October 2018. Entegra recall number: 9903409. Entegra, (800) 517-9137. Erwin Hymer Group North America Inc.
18V-712: Certain 2018-2019 Aktiv and Aktiv 2; Carado Axion and Banff; and Roadtrek Simplicity, Simplicity SRT, Zion, and Zion SRT motorhomes manufactured from May 16, 2018, to September 30, 2018. The under-mounted generator may overcharge the auxiliary batteries, damaging them. Recall start: October 2018. Erwin Hymer, (800) 663-0066. 18V-733: Certain 2019 Prime Time Impression fifth-wheels, model MPF3000RLS-49, manufactured in October 2018. The side marker lights are incorrectly located. Forest River, (574) 862-1025. 18V-737: Certain 2017 Coachmen Cross Country; 2017-2019 Coachmen Sportscoach and Forest River Berkshire and Legacy; and 2017-2018 Forest River Charleston motorhomes built on Freightliner chassis. The internal circuit board in the rear-mounted power distribution module may have been damaged during manufacturing, possibly resulting in the rear marker lights, brake lights, or turn signals not functioning. Coachmen, (574) 825-5821; Forest River, (574) 295-2117. 18V-752: Certain 2018-2019 Cherokee Alpha Wolf travel trailers and 2019 Cherokee Arctic Wolf fifth-wheels manufactured from July 2017 to September 2018. The awnings may have been mounted with fasteners that are insufficient in length and/or quantity, possibly resulting in the awning arm detaching from the wall. Forest River, (260) 499-2100. 18V-768: Certain 2018-2019 Berkshire, 2018 Charleston, and 2017-2019 Georgetown and FR3 motorhomes manufactured from January 2016 to October 2018. The motorized windshield roller shade at the driver’s seating position may unroll without warning while the coach is being driven. Forest River, (574) 295-2117. 18V-770: Certain 2018-2019 Berkshire motorhomes manufactured on Freightliner chassis from January 2018 to October 2018. The brake caliper mounting bolts may have been insufficiently tightened, which can reduce brake effectiveness. Recall start: November 2018. Forest River, (574) 522-1368; Daimler Trucks, (800) 547-0712. 18V-729: Certain 2019 Reflection travel trailers, models 285BHTS, 287RLTS, and 297RSTS, manufactured from August 24, 2018, to October 1, 2018. The wires to the in-line 50-amp mini-breaker may be installed incorrectly, leaving the circuit unprotected from an overcurrent situation and increasing the risk of a fire. Recall start: November 2018. Grand Design recall number: 910016. Grand Design, (574) 825-9679. 18V-764: Certain 2018-2019 Reflection fifth-wheels, models 28BH and 29RS, manufactured from June 6, 2017, to October 25, 2018. The wires to the 50-amp mini-breaker attached to the bus bar may be installed incorrectly, leaving the circuit unprotected from an overcurrent situation and increasing the risk of a fire. Recall start: November 2018. Grand Design recall number: 910017. Grand Design, (574) 825-9679. 18V-714: Certain 2018-2019 Conquest and BTouring Cruiser motorhomes manufactured from March 14, 2017, to October 8, 2018. The auxiliary solar charging port circuit is not fused. When solar panels are connected and they exceed the circuit’s amperage capacity, the risk of fire increases. Recall start: October 2018. Gulf Stream recall number: 10112018. Gulf Stream, (800) 482-6456, extension 5208. 18V-760: Certain 2019 Pioneer BH280 travel trailers manufactured from March 17, 2017, to October 10, 2018. A flexible propane hose, instead of a rigid metal tube supply line, was installed on the outside cooktop, running into the firebox of the stove. Recall start: December 2018. Heartland recall number: 99.01.41. Heartland, (877) 262-8032. 18V-686: Certain 2019 Jay Flight travel trailers manufactured from August 1, 2018, to August 23, 2018. The turn signal and brake lights were wired incorrectly, causing the lights to work intermittently. Recall start: October 2018. Jayco recall number: 9901408. Jayco, (800) 517-9137. 18V-689: Certain 2019 Precept and Precept Prestige motorhomes built on Ford chassis from July 17, 2018, to October 10, 2018, and equipped with 22.5-inch front wheels. The front-wheel hub assembly may have wheel studs that were not properly heat-treated, which could affect vehicle handling. Ford, (866) 436-7332, or Jayco, (800) 517-9137. 18V-723: Certain 2019 Dutchmen Aerolite and Atlas; Keystone Bullet, Laredo, Cougar, Hideout, Passport, and Springdale; and Crossroads Sunset fifth-wheels and travel trailers manufactured from July 2018 to August 2018. The axles may be missing inner bearing races on the hubs, which can cause the bearing to burn out or cause the hub to overheat, affecting vehicle handling. Recall start: December 2018. Keystone recall number: 18-334. Keystone, (866) 425-4369. 18V-726: Certain 2019 Crossroads Cruiser and Volante fifth-wheels manufactured from April 2018 to August 2018 and equipped with Longitude awnings. The vehicles may be equipped with incorrect awning switches that do not prevent the awning motor from rolling out the awning while the vehicle is moving. Recall start: December 2018. Keystone recall number: 18-333. Keystone, (866) 425-4369. 18V-681: Certain 2017-2019 Sonic 190VRB travel trailers manufactured from February 22, 2017, to July 27, 2018. The propane manifold may be located close to the axle tube, which can result in damage to the manifold, causing a leak. Recall start: November 2018. K.Z. recall number: KZ-2018-09. K.Z, (800) 768-4016, extension 154 or 153. 18V-705: Certain 2013 A.C.E., Daybreak, Challenger, Windsport, Hurricane, Outlaw, Tuscany, and Palazzo motorhomes manufactured from November 14, 2011, to March 14, 2013. The windshield wiper system may have been incorrectly installed, causing the wipers to fail during use. Recall start: December 2018. Thor recall number: RC000161. Thor, (877) 855-2867. 18V-741: Certain 2018-2019 Chateau, Four Winds, and Freedom Elite motorhomes manufactured from November 1, 2017, to February 28, 2018. The propane hose may not have adequate space between the floor and the metal plate on the refrigerator, causing damage to the hose and possibly creating a propane leak. Recall start: December 2018. Thor recall number: RC000162. Thor, (877) 855-2867. 18V-763: Certain 2017 Tuscany XTE and 2017-2019 Aria, Palazzo, Tuscany, and Venetian motorhomes manufactured from June 3, 2016, to October 30, 2018, and built on Freightliner chassis. The power distribution module may have been damaged during manufacturing, possibly resulting in the rear marker lights, brake lights, or turn signals not functioning. Recall start: December 2018. Thor recall number: RC000163. Thor, (877) 855-2867. 18V-780: Certain 2018-2019 Aria and Venetian motorhomes built on Freightliner chassis and manufactured from January 15, 2018, to September 10, 2018. The brake caliper mounting bolts may have been insufficiently tightened, which can reduce brake effectiveness. Recall start: January 2019. Thor recall number: RC000164. Thor, (877) 855-2867. 18V-779: Certain 2019 Unity motorhomes, models U24MB, U24CB, U24TB, U24IB, and U24FX manufactured from June 1, 2018, to September 19, 2018. The driver’s side front trans-mount leveling jack support bracket may contact the brake line, causing a brake fluid leak. Recall start: November 2018. 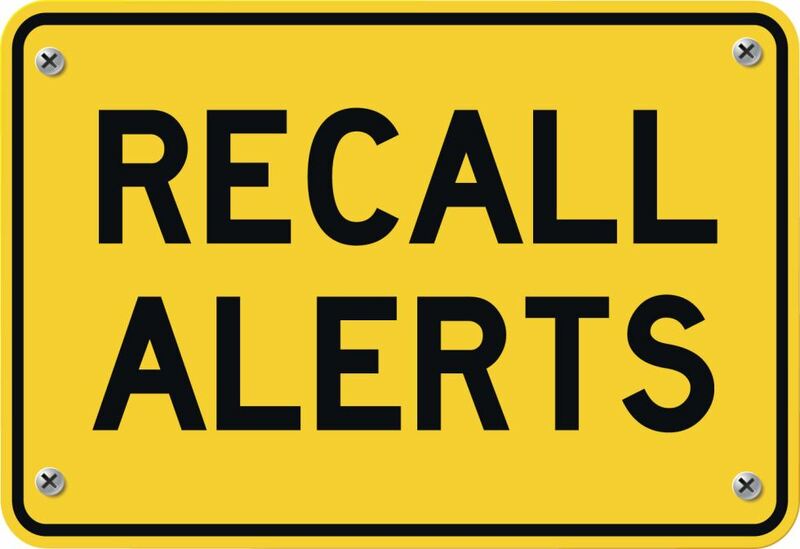 Triple E recall number: CA#9146-1. Triple E, (877) 992-9906. 18V-682: Certain 2017-2019 Minnie Drop travel trailers manufactured from December 21, 2016, to February 20, 2018. The propane supply line may be missing P-clamps, allowing the line to contact the refrigerator’s burner assembly, increasing the risk of a fire. Recall start: November 2018. Winnebago, (574) 825-5250.